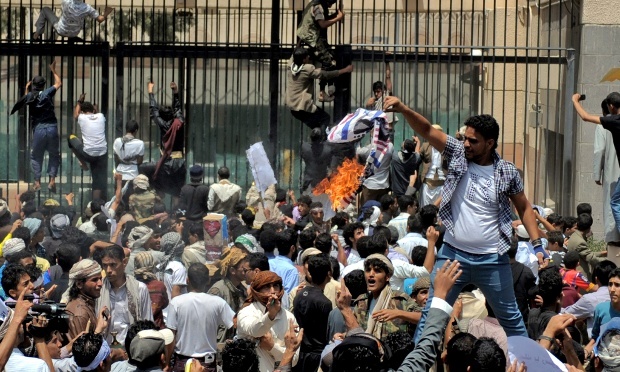 The Yemeni government said on Thursday that there had been no casualties as a result of the storming of the embassy compound and vowed to protect all foreign embassies in the capital. The protesters succeeded in breaching security at the outer perimeter of the embassy, breaking into the compound and burning the US flag, but they were unable to gain entry to the embassy buildings. The incident came a day after the killing of the US ambassador to Libya, Chris Stevens, and three other Americans in an armed assault on the US consulate in Benghazi, and a demonstration at the US embassy in Cairo, where protesters managed to take down the Stars and Stripes before being evicted. In all three countries the ostensible reason for the demonstrations was fury at a virulently Islamaphobic video, which appeared online in July but only drew a mass audience in the past week after Christian and Muslim radicals started to publicise it. The maker of the film, Innocence of Muslims, which crudely denigrates the prophet Muhammad, called himself Sam Bacile and claimed to be Israeli American, but that appears to be an alias. A Coptic Christian living on the outskirts of Los Angeles, Nakoula Basseley Nakoula, later admitted to the Associated Press that he had managed and provided logistics for the film. Nakoula, who pleaded no contest to bank fraud charges in 2010, denied being Sam Bacile, but a mobile phone used by the elusive director in earlier interviews was registered under Nakoula’s address, and he had previously used similar aliases. Mainstream Coptic Christian organisations in Egypt have repudiated the film, but its viral spread on YouTube â€“ deliberately fanned by religious zealots on all sides â€“ was a powerful demonstration of the volatile power of the internet. In the aftermath of Stevens’s death, President Barack Obama swore that “justice will be done” and telephoned his Egyptian counterpart, Mohamed Morsi, and Libya’s interim leader, Mohammed Magarief, to call for better security for American diplomats. Obama expressed appreciation for the Libyan government’s role in ultimately repelling the attackers in Benghazi, an extremist faction calling itself Ansar al-Sharia, and for taking Stevens to hospital. However, the president was cool towards Morsi, who initially only issued a mild rebuke to the rioters on Facebook. Egyptian security forces failed to prevent the storming of the compound and only evicted the demonstrators hours later. Egypt is the biggest recipient of US bilateral aid after Israel, receiving about $2bn (Â£1.24bn) a year, more than half of it in the form of assistance to the country’s armed forces. But Obama was tepid about relations with Cairo in a television interview with Telemundo aired on Wednesday, saying: “I don’t think that we would consider them an ally, but we don’t consider them an enemy”. Speaking during a visit to the European Union in Brussels on Thursday morning, Morsi insisted he had condemned Tuesday’s attacks “in the clearest terms” when he spoke to Obama. The Egyptian president also harshly criticised the Innocence of Muslims film. “We condemn stronglyÂ â€¦ all those who launch such provocations and who stand behind that hatred,” Morsi said, adding that he had asked Obama “to put an end to such behaviour”. Morsi, who is hoping to carry out structural reforms to overhaul Egypt’s ailing economy, is seeking a $4.8bn loan from the International Monetary Fund, but more could be required.